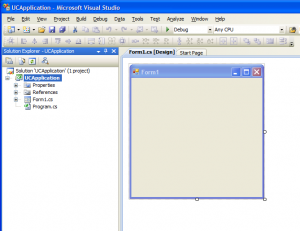 Let’s kickstart this tutorial by creating a brand-new project in Visual Studio. 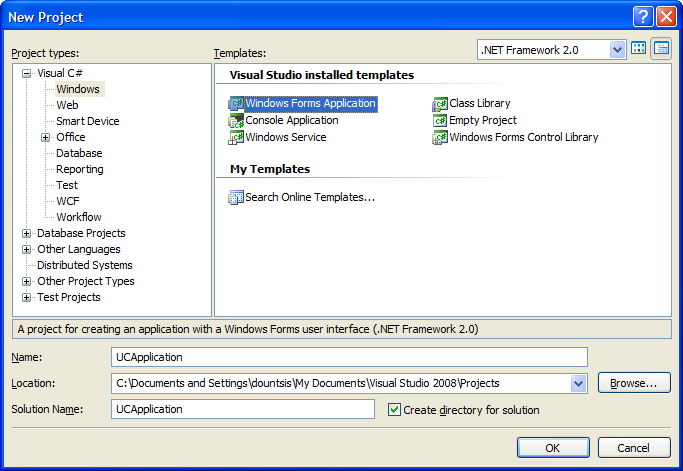 We select File/New/Project… and select the “Windows Form Application” project template as shown below. I have named the project as‘UCApplication’. 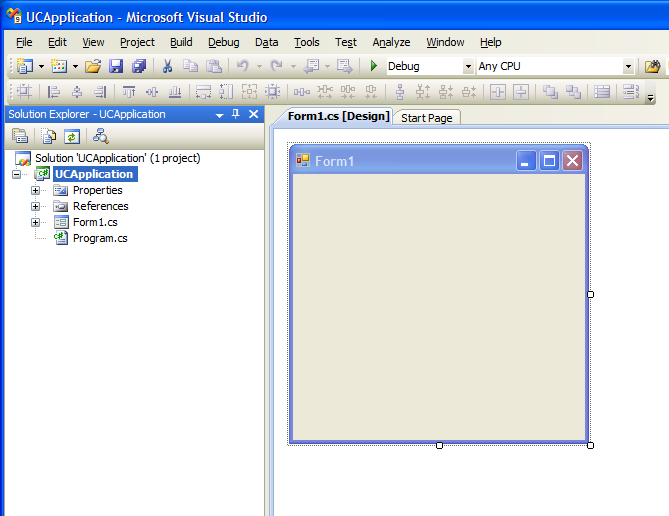 The next step is to customize the skeleton project that Visual Studio has created for us. 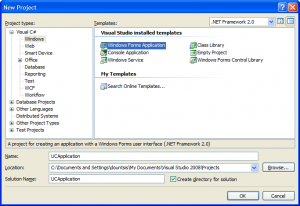 By default Visual Studio has created a single WinForm that is named as Form1. Our application will have only one winform in which we will load our UserControls. Therefore we will rename Form1 to MainForm. 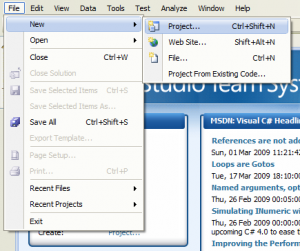 In the Solution Explorer (the bar on the left-hand side of the Figure 3), we rename the Form1.cs to MainForm.cs (right-click on the file and select the option Rename or click on the file and press F2). 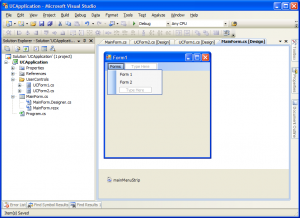 Visual Studio will prompt a question whether we want to rename all the references of the code element ‘Form1′. We answer yes so that every occurence of the object Form1 will be changed to MainForm. 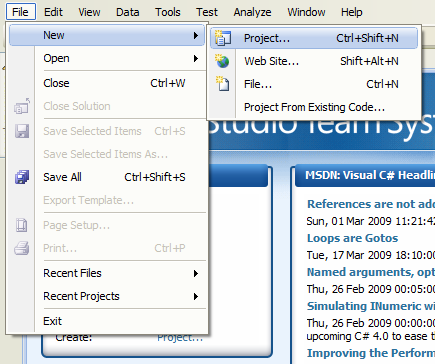 Note: You can always make visible the Solution Explorer by selecting View/Solution Explorer from the drop-down menu. The next step is to create a folder in our project that will host all the User Controls of our application. 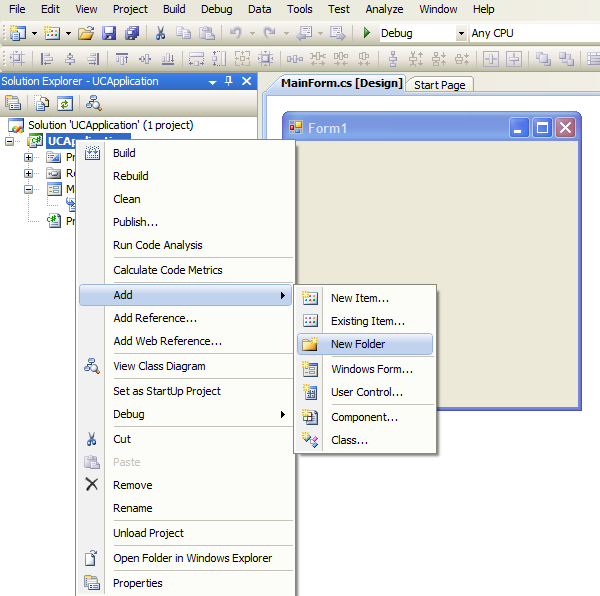 Right-click on the Project name and select the Add/New Folder and name it as ‘UserControls’ (Figure 4). We can now right-click on the folder that we just created and select Add/User Control to create our first User Control for our application. We will name it as UCForm1. 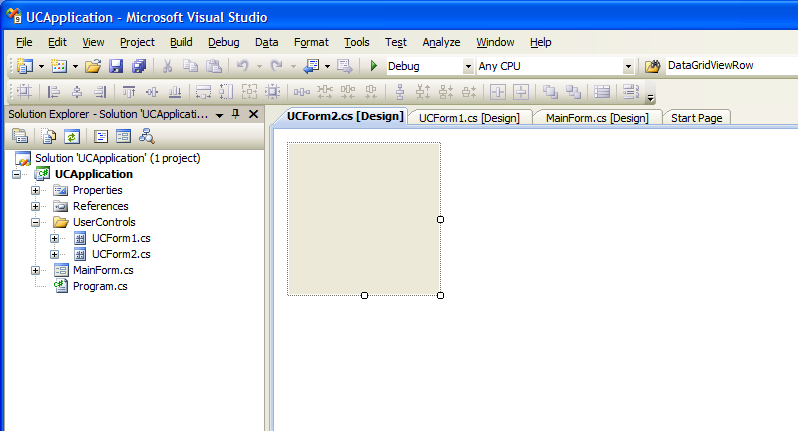 Repeat the same step to create a second User Control and name it as UCForm2. Note: We use the prefix UC as a naming convention for all our User Controls. The next step is to add some code that will load and display our User Controls in the MainForm of our application. 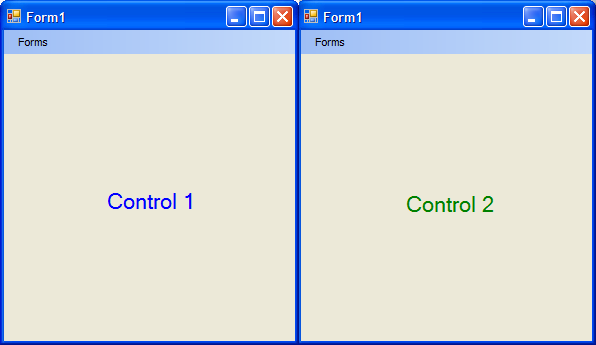 We will use a pull-down menu in our MainForm to allow the user to invoke the User Controls (UCForm1 andUCForm2). 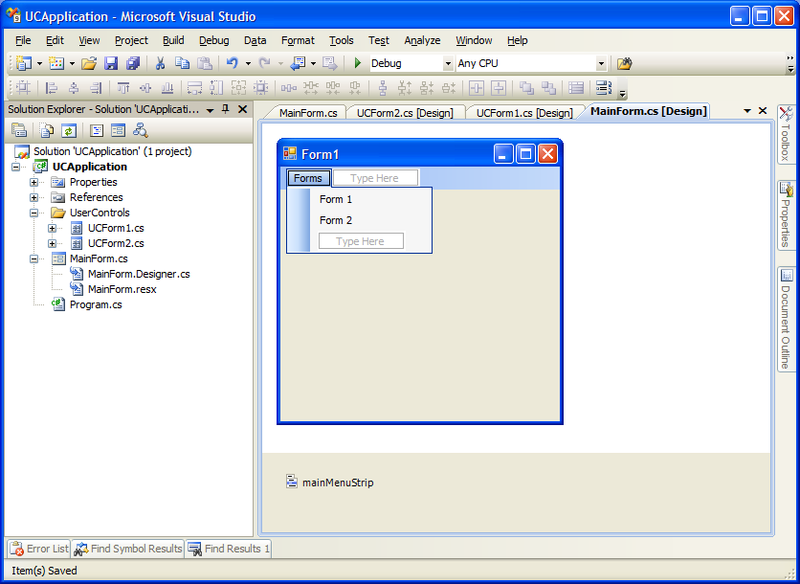 Add a MenuStrip control to the MainForm (drag-n-drop from the toolbox to the MainForm), rename it as mainMenuStrip and replicate the structure as shown in figure 6. Double click on each of the menu items (“Form 1″ and “Form 2″) to create the events that will fire up when the user clicks on each menu item. We now need a mean of enabling and displaying the desired User Control while hiding all the other ones. 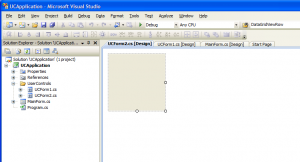 We will create a method inside the MainForm class to handle this task. /// Displays the selected UserControl. This method receives as argument the control that we want to display. It loops through the pool of available User Controls. Since all our User Controls start with the prefix ‘UC’, it concentrates on those and ignores all the other controls like buttons, menu items, etc. 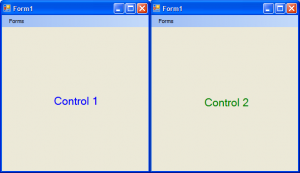 When the desired control is located then the method enables it, makes it visible, set it to fill the available area of the MainForm and brings it to the front for our users to work with. If you build and execute the application at this stage you may think that nothing happens and that you have wasted your time. Trust me this is not the case. What happens is that we have not customized each User Control so they are identical to each other. For the purpose of this tutorial, we will simply add a label in each User Control with different text and color to distinguish them. Figure 6 demonstrate the result. 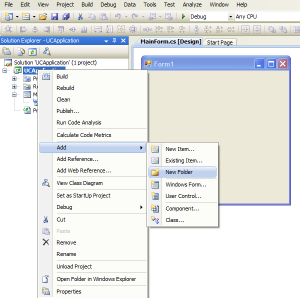 In this tutorial, I have demonstrated how we can group the presentation layer of our WinForm application under distinct User Controls that are presented through a single WinForm. In doing so, we keep our application with a consistent interface that does not confuse the user by having window popping everywhere on the screen. I am certain that it won’t take a while for someone write a comment below that we are loading all the User Controls to the memory even if the user never requests them. In cases, where we have lots of controls then we may want to modify the technique described in this tutorial so that it instantiates the controls upon request. I hope that you have enjoyed the tutorial and that you found it useful.